If you get married in Italy the town or city where you have your bridal ceremony will prepare a very nice Italian marriage certificate, which can be used to legalize your marriage ceremony in your home country when you return after your honeymoon. To formalize your destination wedding in the country from where you are originating you must record or register your overseas wedding at the local public office of the town or city you are coming from. 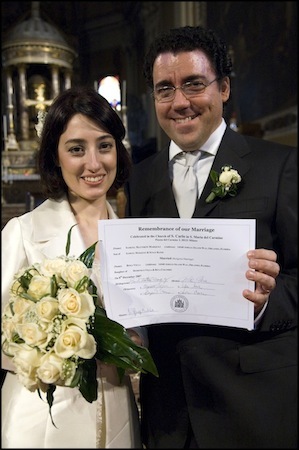 Only one marriage certificate is given to each couple by the authorities in Italy. If you want to have more than one copy you must let your wedding coordinator know ahead of time. It is always good to have several copies of your marriage certificate. Once you leave Italy additional copies maybe very difficult to obtain later on. Marriage certificates can be translated and authenticated if necessary. Ask your wedding planner for the details.